This is what my kitchen looks like Saturday afternoon, midsummer. Heaven! I’ve written a lot about my adventures at the Farmer’s Market this year, and I’ve often referenced the ‘game’ that D and I always play. We make it our mission each and every week to find at least one *special* item amidst the many. Ideally it’s something I’ve never cooked with (or never eaten at all! ), but maybe it’s something just come into season, all new and nostalgic and treasured (hello, berries!). So along with all the standards and staples, these are the specials we picked up each week. I love how this list paints the progression of the seasons. *Star means I’d never cooked with it before. **Double star means I’d never even eaten it! 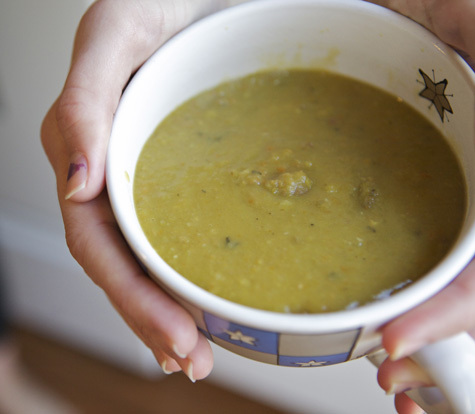 My spin on a clasic soup: Split Pea With Fennel And Potato. 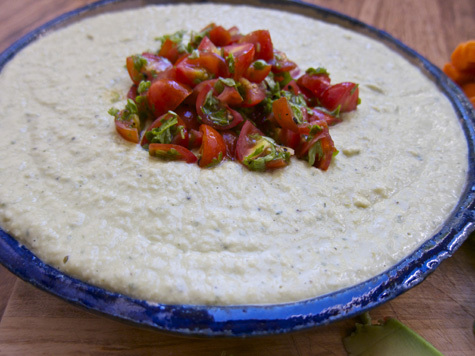 My first ever experiment with Favas – fresh Farmer’s Fava Bean Dip. Raw peach and berry tart with cashew cream. 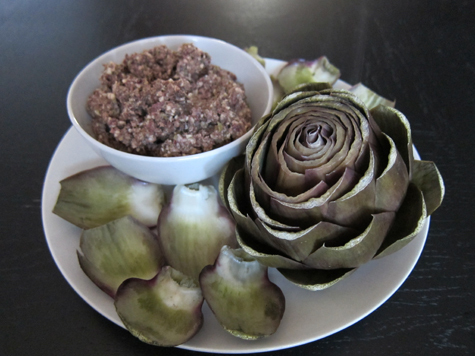 Steamed Italian Artichoke served with a chunky three-olive dip. 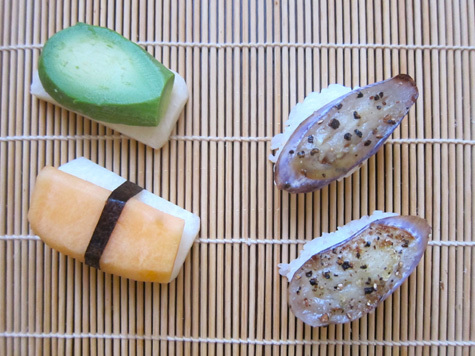 Vegan nigiri with seared Japanese Eggplants. 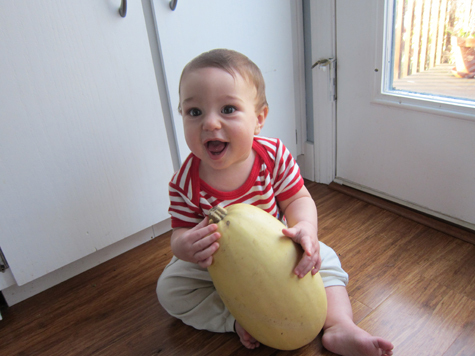 Waits helps me prepare my very first Spaghetti Squash. Question: I treated myself to some ohh-la-la fancy Black Truffle Salt from the very last Farmer’s Market. What on earth should I do with it??! What to do with delicious black truffle salt??? Everything! I actually got some for Christmas. I sprinkle it on avocado mashed on toast..it’s good on roasted veggies..adds a new flavor to most soups..SOOO good on popcorn..possibilities are endless! If you have The Mediterranean Vegan Kitchen (if you don’t, your library does) I highly recommend the tomato fennel soup, but with fresh tomatoes instead of canned. I LOVE FENNEL OMG. I like your challenge! If I find a good farmers market maybe I’ll try it next season. (The closest farmers market to me is ok, but there are only a few farmers (like… 2 or 3, for serious) and there isn’t ever anything cool and exciting. I have never cooked with romanesco. I’d be afraid of ruining its amazingness. What did you do with it? I was thinking about trying to grow it, because OMG, produce doesn’t get much cooler than that. It’s math! Woo! I cannot bring myself to be excited about fancy salt (although salt on chocolate is a new exciting food to me). Are they really worthwhile? Wash artichokes and cut the biggest leafs but also cut them on the top. Enjoy :) and Buon appetito! TOTALLY GOING ON AVOCADO! Yessssssss!!! Thanks guys. What else!? @ Meghan – I grew up in a Mediterranean climate, *totally* different produce! Plus I have to say, Damian is pretty picky . . . he distrusts greens and despises mushrooms! Ack! Clearly, this year I got over the mushroom thing and just started cooking them on the side. So good! @ Andrea – Thanks for the recipe, I’ve never seen anything like it. Sounds great! Oh my goodness, I haven’t had internet in forever and have been so so busy with school, but now I get to read all the posts I missed! Yay! I missed this blog so much! Oh, fennel…I swear half my childhood was spent pulling over to the side of the road because my dad found some wild that he wanted to pick. Haha. I’ve used black truffle salt in tofu scrambles, sprinkled on top of homemade crackers and flatbreads, and stirred into risotto. 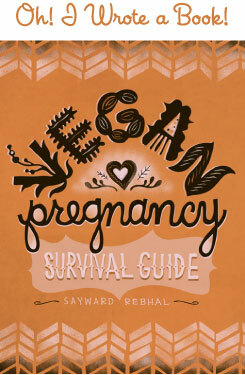 Wow, those foods you’ve never had are like mainstays for me. I’m guessing it’s because I’m from Louisville and we can grow squash so easily here, and fennel??!!! Seriously? Mustard greens? Oh they’re my favorite, so spicy! And favas make the best falafel in my opinion! This post made me so happy. Enjoy your new food adventures! Romanesco is awesome! Fractals are delicious! I’m with Damian on the mushrooms. Like others, my CSA share lead me to confront unknown veggies. Like Kohlrabi! And any variety of kale that isn’t the standard stuff in the grocery store… lacinato! red russian! @ Kathryn – Welcome back! @ Monika – Mmm, tofu scramble sounds grand. 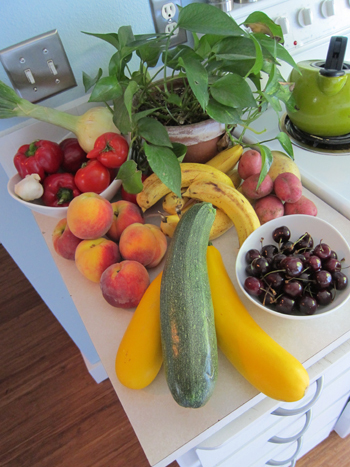 @ April – I want to get a CSA this year, though it won’t stop me from going to the FarMar every weekend!